Does your child have a cough? You might consider Winnie the Pooh’s favorite food – honey – to soothe your child’s cough. Be careful, though, as honey is not appropriate for all children. Babies should not have their first taste of honey until their first birthdays, as infants are susceptible to a serious illness, known as infantile botulism. Small particles of dust and dirt can contaminate honey. These particles may contain bacteria known as Clostridium botulinum, which produces dangerous toxins when the bacteria do not have enough oxygen. These honey-loving toxins, known as botulinum toxins, are one of the most lethal toxins known. They interfere with the nervous system to paralyze muscles. This paralysis causes muscle weakness and can make it very hard to breathe. Infants are susceptible to infantile botulism because their digestive tracts have not fully developed. Babies are most vulnerable to infantile botulism when they are between 3 weeks and 6 months old. Coughing serves an important function in the body – it helps clear mucus and debris from the lungs – so you should avoid giving your child a cough suppressant unless the coughing poses a problem. Nighttime coughing can prevent your child from getting the sleep he or she needs to recover from a cough, for example, so suppressing a cough at night can be helpful. The thick consistency of honey coats your child’s throat to calm irritation that causes coughing. Putting honey in hot tea is a great way to soothe a sore throat that often accompanies coughing. If you want to give your child tea with honey before bedtime, be sure to use decaffeinated tea. A recent study found that two teaspoons of honey at bedtime worked as well as a common over-the-counter cough suppressant to reduce nighttime coughing and improve sleep in children age 2 and over with upper respiratory tract infections. The researchers who conducted the study said honey probably soothed the cough because it has antimicrobial and antioxidant properties. An antimicrobial would kill any bacteria, viruses or fungi that might be causing the cough. Antioxidants boost the immune system by fighting off free radicals, which are unstable molecules that can damage cells. While cough suppressants do suppress coughs, they do not have the antimicrobial and antioxidant properties of honey. The active ingredient in cough suppressants, dextromethorphan, is also associated with side effects that include vomiting, drowsiness, nausea, dizziness, diarrhea, and constipation. Many over-the-counter cough suppressants contain other ingredients that may also cause unwanted effects. In fact, the risks of using cough suppressants in kids so greatly outweigh the benefits that the American Academy of Pediatrics (AAP) does not recommend the use of an over-the-counter cough and cold medications for children 4 years and younger. AAP also recommends caution when for use in kids aged 4 to 6 years. Aside from the potential to cause infantile botulism in babies under the age of 1 year, there are no known side effects associated with honey. Honey is inexpensive, easy to administer, and lasts virtually forever when stored properly. 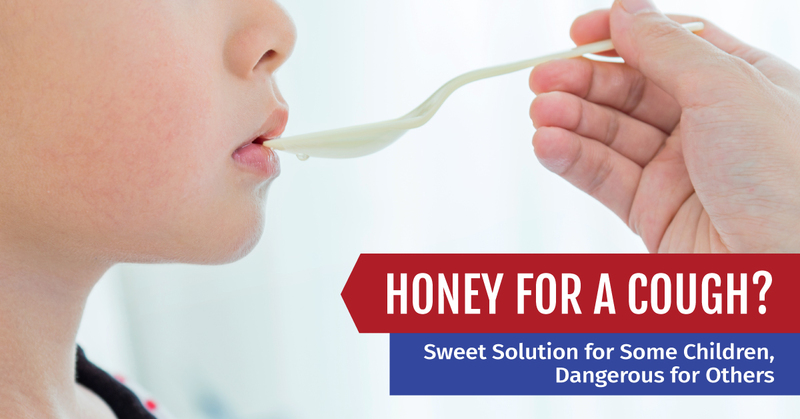 Best of all, honey is delicious, so your child will never struggle when it is time to take cough medicine!